What If Your Income Stopped Tomorrow? At any given time, a lot of people are out of work due to injuries. I’m sure you’ve thought about the possibility of not having any paycheck coming in. Right? But it’s one thing to be unemployed and another to be physically unable to work. If you are self-employed or if you are not covered by a disability income plan through your employer, it clearly makes sense to consider purchasing an individual disability income protection plan. Why do I need this? Won’t social security cover me if I’m disabled? 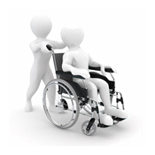 Disability insurance replaces a portion of your income if you become disabled and are no longer able to work. No plan will cover ALL of your salary for fear that you would have little or no incentive to return to work. Disability is something most people do not like to think about. But the chances that you will become disabled are probably greater than you realize. Studies show that a 20-year-old worker has a 3 in 10 chance of becoming disabled before reaching full retirement age. What questions should you be asking yourself before applying for a disability income plan? How much income will I need each month? How many years would I want it to continue? From the time I become disabled, how long would I want to wait before the disability income starts paying me? Call me if you would like more information or a proposal. I have clients paying as little as $40/month for a $2,000 income protection plan. Should I Ask for the Cash Price? Good News! CHOICE is back. You deserve to know that OBAMACARE is NOT the only approved health plan. We have ObamaCare plans as well as other, more competitive health plans. How is this possible? The elimination of the Individual Mandate. Please complete this form. We will send you a COMPARISON as soon as possible.